LOS ANGELES, CA - On Saturday, June 25, 2016, join MC Lyte, Nicci Gilbert and more of their celebrity friends for this year’s "Women, Wealth & Relationships" forum presented by Hip Hop Sisters Foundation and the BET Experience. This year’s forum will be held at the Los Angeles Convention Center, West Hall Theatre from 1:00 p.m. to 2:30 p.m. PST and a few lucky attendees will have an opportunity to win tickets to this year's BET Awards Show (www.hiphopsisters.info). "I believe our attendees will once again find that this forum is lifechanging. We’ll deliver the content with an enlightening and conversation-oriented Q&A format, which will be outrageously funny and educational at the same time. Because attendees will get the wisdom they need to master their money, the “Women, Wealth & Relationships” forum is something that I look forward to each year. And it’s all possible thanks to our partnership with the Debra Lee, Stephen Hill, Louis Carr and the entire BET Experience family," says MC Lyte. Hip Hop Sisters Foundation has touched so many lives since its inception and the upcoming W.E.A.L.T.H. Experience (www.wealthexperience.info) will provide the energy needed to continue to inspire people all over the globe to build and maintain wealth within an environment that is as practical and down to earth as they are educational and informative. 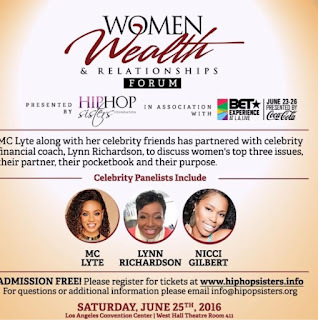 Foundation President/CEO Lynn Richardson, a celebrity financial coach featured on BET, Centric and in other media outlets (www.lynnrichardson.tv), will moderate the "Women, Wealth & Relationships" forum for the third year in a row. She’s back with her quick wit and humorous presentation style, assisting attendees with their top three issues: their partner, their pocket book and their purpose. "I am committed to nurturing my ministry for the benefit of others and through this forum, I hope to create programs that align with the foundation's mission of providing real tools to empower women and their families economically," says Lynn Richardson. Admission is FREE! VIP seating can be accommodated for early registrants. For more information or to register, please visitwww.hiphopsisters.info.